Lucid Technologies, Inc helps clients achieve their business goals by building, integrating and supporting mission-critical applications and systems for optimized quality, increased business value, faster time-to-market and reduced total cost of operations. Lucid Technologies, Inc's Enterprise Integration integrates data and applications for companies and organizations to deliver fully functional business solutions. We blend our best-of-breed tools, standardized processes and skilled resources in enterprise architecture, enterprise application integration, business intelligence/data warehousing, business continuity/disaster recovery and network security to help our clients leverage information for optimal business value. With a SOA approach, a depth of industry experience and a proven track record of integrating data, applications and technology, Lucid Technologies, Inc has the knowledge and resources to help you meet your enterprise integration goals. Lucid Technologies, Inc's Enterprise Application Integration practice provides a structured information processing and delivery framework that has helped leading global organizations break down information barriers across the enterprise. Our comprehensive suite of Enterprise Application Integration and B2B integration services delivers an end-to-end solution that addresses the four critical elements of business operations: business, people, process and IT. Our Enterprise Application Integration and B2B integration solutions are designed to deliver measurable results and rapid ROI, and strike the right balance between business and IT needs. Using an end-to-end, Modeled-to-MeasureT approach that customizes our Enterprise Integration solutions, we have helped many companies build integrated business practices that span organizations, people, systems and applications. The Modeled-to-MeasureT methodology makes it easy to propagate standard business procedures and information across an organization's value chain, to better leverage the value of Enterprise Application Integration investments. You've spent time and money carefully planning, building and implementing the key technologies necessary to run your business. You know the importance of integrating these technologies to provide competitive advantage and maximize your IT investment. You know integration is the key to reducing complexities, improving time-to-market, reducing costs, delivering accurate information, improving performance and productivity, increasing reuse and providing flexibility and scalability. You also know you have unique needs based on your industry, size and business objectives. How do you integrate your technologies efficiently and cost-effectively to meet your business needs? Lucid Technologies, Inc's Enterprise Integration practice focuses on delivering solutions geared to your unique business needs. Integration isn't an abstract concept - it's combining organizational, business, applications, data and technology architectures in the right way for your business. We know that no one strategy is right for all companies and we work with you to understand your infrastructure and processes to create a comprehensive solution. We focus on understanding your business goals to ensure your enterprise integration initiative has a direct connection to these goals, providing added value and increased flexibility each time new infrastructure is deployed. An integration solution that doesn't incorporate your key data, applications and business processes, isn't really a solution. To help you achieve application interoperability, Lucid Technologies, Inc uses consistent processes focused around data, application and technology integration. Our approach addresses key enterprise architectural components including organizational structure, business, applications, data and technical sub-architectures. Clients benefit from our reusable, repeatable assets, ranging from process and methodology to best practices. By offering a comprehensive approach to your mission-critical enterprise integration initiatives, Lucid Technologies, Inc can provide the solutions to help you harness the power and benefits of enterprise integration. Lucid Technologies, Inc uses IT-proven best practices and competitive research to guide, assess, enhance and create turnkey systems to support your business goals. Lucid Technologies, Inc has the range of services to meet your current and future enterprise integration needs. Enterprise architecture is at the heart of any good enterprise strategy. Enterprise architecture provides the supporting system to further business strategy. To fully use current and future technology, your enterprise architecture must be stable, consistent and accessible. Lucid Technologies, Inc offers a wide range of services, from development to refinement, to attain your architectural goals. Lucid Technologies, Inc understands that while much of an enterprise's architecture may be unique to the enterprise, building on industry best practices is essential for maximum effectiveness and efficiency of architecture efforts. Lucid Technologies, Inc's enterprise architecture services are driven by industry best practices. Our team of experts designs service-oriented, component-based architectures that can be reused across multiple business processes and applications. This allows for flexibility and adaptability to market dynamics and for more efficient replacement and integration of application components. We work with you to ensure your enterprise architecture and developed applications satisfy business needs. We can provide technology selection and standardization, process management, project management and software design and implementation. Our team can offer insight on IT governance, enterprise IT architecture and IT processes and standards. To ensure IT capability is in tune with business needs, enterprises need a method of synchronizing IT architecture with the business. To accomplish this, application integration and middleware, the system software or runtime infrastructure used to provide intra- and inter-application communication, must be used. Middleware is typically layered between an application program and the operating system and network transport service. Application integration and middleware includes software products such as message-oriented middleware, integration broker suites, transaction monitors, object request brokers and application servers. Lucid Technologies, Inc has the resources and expertise to help you use EAI to best advantage. Whether it's integrating business-to-business (B2B) and business-to-consumer (B2C) environments with legacy systems through use of middleware (e.g. MQSeries, CORBA and MSMQ), N-tier component-based architecture and communication technologies, Lucid Technologies, Inc's approach integrates applications and information previously isolated in individual silos, which enables these systems to efficiently share information with one another, as well as with other systems. For example, Lucid Technologies, Inc helped a large theme resort with part of its strategy to remain the premier provider of family vacations by integrating multiple systems to obtain more guest information to tailor service offerings to individual guests. The project, the largest IT and business re-engineering project in the history of the company, required Lucid Technologies, Inc to help seamlessly integrate multiple legacy systems - central reservations, tour wholesaling, sales & catering, property management, dining reservations and various marketing automations - to support the accurate and timely exchange of data across multiple systems creating a single source of data for all data. The end result was a state-of-the-art CRM infrastructure that tightly integrates critical operational touch-points and strategic analytical systems to help the client anticipate guest needs and provide better customer service, thus driving increased guest visitation and satisfaction. 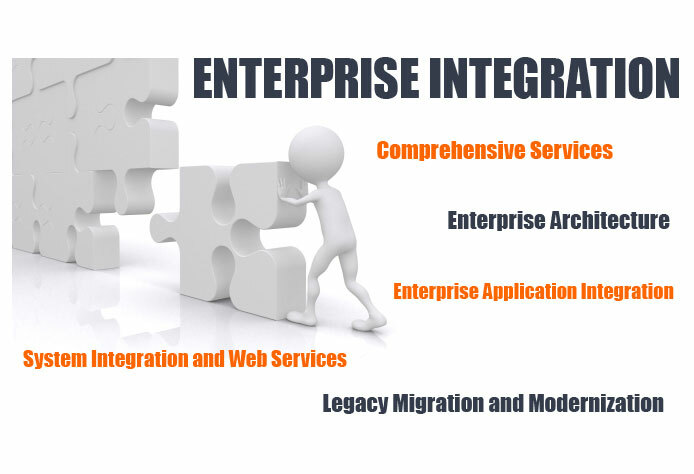 To further facilitate EAI, Lucid Technologies, Inc's Enterprise Application Integration practice includes expertise in legacy migration and modernization and systems integration and Web services. Lucid Technologies, Inc's approach to legacy migration and modernization is tightly integrated with our approach to enterprise architecture and enterprise application integration. We emphasize the need to leverage the vast commercial enterprise investments currently locked in legacy systems. Our approach may include exposure of legacy business processes and applications into new architectural environments through application wrapping and Web services. Lucid Technologies, Inc's approach to comprehensive system integration and Web services emphasizes analysis and design with a strong business focus. Lucid Technologies, Inc designs and delivers service-oriented, component based architectures, covering data, applications, and process integration and driven by industry best practices. We believe that service oriented architectures, including Web services, can provide reusable, simple and standards-based access to business objects, thereby saving money and time. These services can be exposed through other interfaces including User Interfaces (Web, IVR, WAP, using JSP, Servlet, XML, XSLT) and system interfaces (EDI, JCA, Web services).